It’s a word (answer) we believe will help get us out of making a decision or a commitment we’re certain, in the back of our minds, we aren’t, can’t, or won’t keep. We don’t want to hurt feelings so, “Maybe” gives us a way out. Only, it’s not a way out; it’s indecision. Now, I’m not preaching to the choir or holding myself up as a decision guru. When I worked, my decisions were quick and decisive, but take me out to dinner and this is what my decisions look like.”Maybe” has be en my fall guy for many years. “Maybe” has been my fall guy for many times. But, here’s the thing, it also leaves jagged edges behind. Invitations stop, projects lay unfinished, and feelings are hurt. 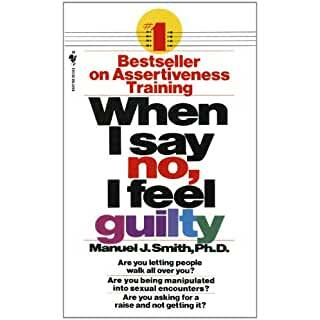 As I’ve gotten older, I do my best, to be honest with myself and say, “no” instead of “maybe.” It isn’t always easy, but I have encouragement from one of my all-time favorite resources – a book by Manuel J. Smith, Ph.D. When I say no, I feel guilty. Since the day I discovered this book, I have kept it close by for easy access and referral. The very from page includes a Bill of Assertive Rights. The next time you’re tempted to say “maybe” want to say, “No” – be true to yourself; you have that right. How true, I’m the world’s worst for saying “maybe” and at my age I really should stop, I’ve passed the age of eighteen, I’m a grown adult, I have the right to say “no” and not feel guilty. Thank you so much. I’m glad you liked it and I agree – we all have the right to say “no.” Happy you stopped by the Cow Pasture to read and join the conversation. An incredibly important post & life-lesson. Written in a very conversational, down-to-Earth tone that I believe is perfect for this piece. Wonderful! It truly is my go-to book, reminding me -I have the right to say, “no.” Thanks for reading and commenting and thanks for the follow.Welcome to the fence jumpers. I guess what important is, people should start accepting a ‘no’ without expecting any sort of explanation. Guess then we’d become certain regarding things. Aw, good point. We are continually explaining ourselves. One of my favorite techniques learned from the book I mentioned, is the “Broken Record.” When pushed to explain a position (No), repeat the exact same sentence until they stop asking. The key is to keep the sentence exactly the same. For Example, “I won’t be able to attend, I have other plans.) Glad to see you in the Cow Pasture and thanks for joining the conversation. I just read somewhere that “No is a complete sentence!” I like that. People have to be prepare to hear no when they ask something of you, even when it is hard to say. Absolutely! Imagine a two letter word being so difficult to utter. It’s as difficult as saying, “sorry,” but if we’re to be true to who we are, we must learn to say it. Thanks for reading Mark. It’s always good to see you in the pasture. I really love your post. Years ago a wrote an unpublished workbook called “Saying and Hearing No and Feeling Okay”. I’ve been thinking about putting all or part of that workbook on my blog… as a series of posts. After reading your post I will think more seriously about doing that. It also reminded me of how my co-therapists and I teach clients to be direct and not use words and phrases that minimize what they are thinking or saying such as maybe, just, kind of, sort of, possibly, etc. Thanks for giving me new ideas to ponder first thing in the morning. You’re very welcome. If not familiar with the book, I mentioned, get it. It has proven invaluable to me and I’ve given away so many copies. Thanks for reading and good luck with your blog.